Happy New Year – I’m Ba-ack!!! Happy New Year to one and all. I’m back on the blog. I took a little leave of absence during the holidays for 2013, but I’m back on the wagon now. One of the phrases that you hear at this time of year is the phrase that I started this blog with – Happy New YEAR!!! It’s a phrase that means something. It implies a new start, which is exactly what I’m doing for this year. Part of this new start involves being resolved to do new and greater things and be a better person than you started the year. In doing this I have resolved to do much this year. I’m going to write more consistently on this blog about music and life and playing by ear. I have also resolved to working out more consistently through out the year. There will be several blogs about that. Additionally I am determined to read through the entire Bible this year as well. There will be blogs about that as well. It will be a great year. 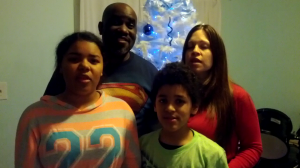 And so I leave you with a song that my family recorded on Christmas Day! (It took a little over an hour to put together!) We wish you all the Blessings for 2014 and our Hope is that you find what you need this year. What a talented family! Great harmonies! I had quite a long time away from my blog but like you. I am determined to get back on it. I look forward to hearing more from the Hunte family in 2014. Is Playing By Ear Easy? admin on Is Playing By Ear Easy? Rachel Lavern on Is Playing By Ear Easy? Martha on Is Playing By Ear Easy?